A science farce trying to recreate the vibe of Bringing Up Baby (1938), Monkey Business finds Cary Grant reunited with Howard Hawks but neither the script nor the execution are sharp enough. There are some good laughs scattered in the story about a monkey-made concoction that reverses ageing, but also quite a few clunky and awkward moments. Research scientist Dr. Barnaby Fulton (Grant) is struggling to come up with a formula that reverses the ageing process. Barnaby is happily married to the supportive Edwina (Ginger Rogers), who tolerates with good humour her husband's absent-mindedness. Working with monkeys at the laboratory of a pharmaceutical company owned by industrialist Oliver Oxley (Charles Coburn), Barnaby's latest formulation is going nowhere, but an escaped monkey randomly mixes the right ingredients, producing a powerful formula that rejuvenates youth. The monkey promptly dumps the mix into the lab's drinking water tank. Barnaby is the first to unwittingly drink from the monkey's formula and temporarily reverts to the behaviour of a teenager, setting out on a wild adventure with Oxley's curvaceous secretary Lois (Marilyn Monroe). 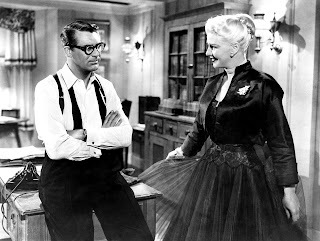 With Oxley dreaming of the riches that the formula will bring to his company but unable to have a rational conversation with the bewildered Barnaby, Edwina gets her turn to unexpectedly become young at heart, and her stint as a juvenile stresses the marriage to Barnaby as she revives memories of old boyfriend Hank Entwhistle (Hugh Marlowe). With a monkey replacing a leopard, Hawks and Grant must have hoped that the mix of science, animals, and comedy that worked so well in Bringing Up Baby would click again. But the Monkey Business script, by Ben Hecht, Charles Lederer, and I.A.L. Diamond, is lacking the necessary cutting edge. While the start of the movie sets up the premise with assurance, the story development sinks into general predictability as the cast members take turns acting like younger versions of themselves. But it's in the final third that Monkey Business stumbles badly. An attempt to descend into farce spirals clumsily into cringe-inducing incompetence, as Edwina incomprehensibly mistakes a baby for Barnaby, while the real Barnaby is busy tying Hank to a tree and attempting to scalp him. It's as awful as it sounds, an embarrassing stretch of intended comedy veering wildly off target. Thankfully, the rest of the movie is better. Grant's early scenes as the easily distracted scientist demonstrate his quirky charisma to good effect, and Rogers is excellent as the loving wife who understands and celebrates her husband's uniqueness. A pre-stardom Monroe as the secretary with no secretarial skills other than killer curves is unfortunately underutilized, but her scenes cavorting with a rejuvenated Barnaby hint at her irresistible screen presence and subtle comic timing. Monkey Business proves true to its title animal: sometimes funny, but unfortunately also over-the-top and prone to causing unintended embarrassment.